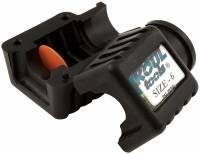 Since the invention of stainless steel braided hosess, racers and mechanics have been fighting with problem of installing it into the socket part of the assembly...until Koul Tools delivered the solution. Pit Stop USA is The Online Motorsports Superstore! Since the invention of stainless braided rubber hose, racers and mechanics have been fighting the problem of installing it into the socket part of the assembly. If your lucky and get a clean cut on the end of that hose, you might get it in. Most of the time a little fuzz appears on the hose end and the battle begins. It is not only time consuming, it can get bloody. 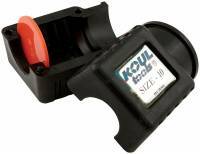 KOUL tools has delivered a solution that makes the assembly a snap. 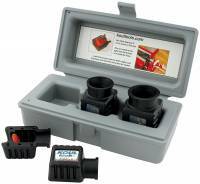 Manufactured of a high tech composite, it is virtually indestructible. No need to worry about vise marks or wearing out. 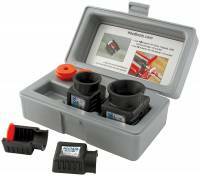 Just insert the socket into the tool, twist the hose in, and in less than 10 seconds you have it assembled. 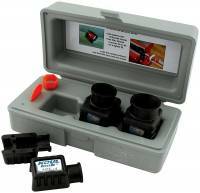 You can repeat this several times without recutting the hose end. The tool can pay for itself the first time you don't have to scrap some hose because it got too short trying to clean up the end. You'll be amazed at the amount of time you'll save. After using this tool, you will say to yourself, "KOUL". 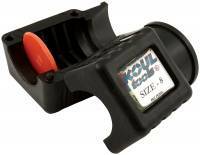 We feature Koul Tools AN Hose Assembly Tools and more at low everyday prices.